NEW Colors! Add a stylish satin ribbon marker to any of our PerfectBooks. Available in White, Silver, Marigold, Shocking Pink, Red, Spring Moss, Teal, Blue, Dark Chocolate, and Black (show in image from left to right). 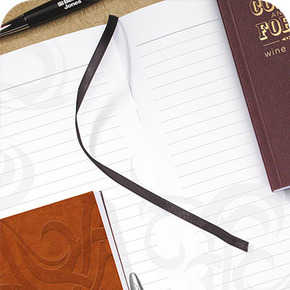 Add setup of $52.50 G for a stock design Mobile Marker, (see GraphicPad designs), and Ribbon Bookmark. Call factory for quote and image approval for custom design.